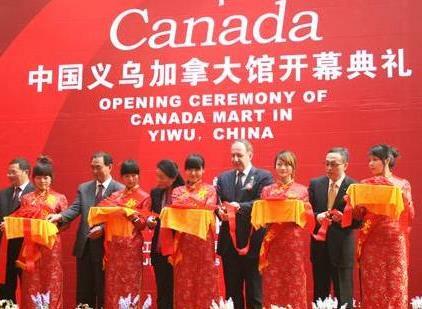 Canada mart opened on April 20, 2011 in Yiwu main market – Yiwu International Trade Center. It is right located inside Yiwu imported commodities mall of Yiwu International Trade Center. The main products of the Canada mart are ginseng and ice grape wine, and also food, daily necessaries. The mart is mainly supplying China local market, also can export to other CAFTA countries and Europe countries. The opening of Canadian mart establishes a communication platform for China and Canada. Through the import products to promote the cultural exchange between the two countries, and also drive more demands of consumer products. Yiwu imported commodities hall is only for imported products from all over the world. This hall is over 100,000square meters, add more than 70 import trade companies. Canada mart is one of them.